Asun is spicy roasted/smoked goat meat! It is not for the faint-hearted but all the heat is worth it! My favourite place to eat asun is from The Place, I love their Asun! 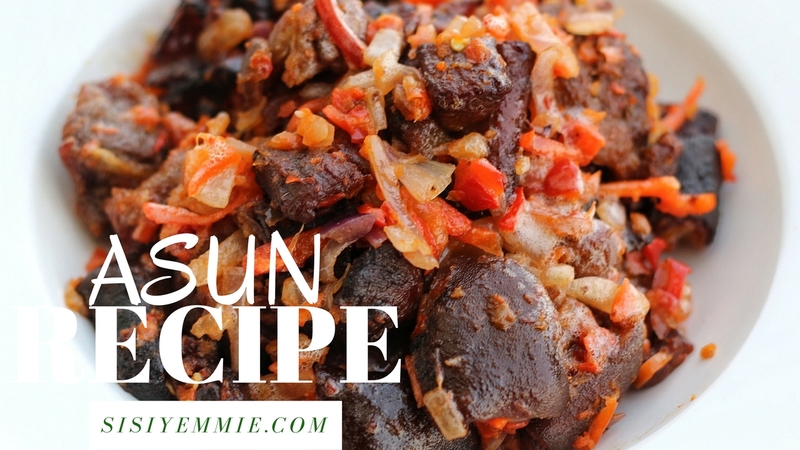 For the step-by-step instructions to make Asun, ingredients list & exact measurements click below. Don't forget to SUBSCRIBE so you're aways first to see my videos! Warning: DO NOT copy my recipe text to your blog or website without my consent! You can share my videos but don't copy my recipe TEXT! Wehdone. Marinate goat meat for about an hour or overnight. That is, add maggi, salt, onion with the goat meat in a bowl, cover and place in the fridge. Boil goat meat for about 20 minutes just to start off the cooking process. Transfer the goat meat to the oven and grill for another 30 minutes till soft. Roughly blend habenero pepper and onions. In a wok preferably, or a pan alternatively, heat up a small amount of vegetable oil, add a lot of onions, peppers and add grilled goat meat. Stir fry for about 3 minutes, covering for 1 minute and take off the heat. Thank you for sharing, Sisi. I loved watching the video. Sisi you nailed it.you are the best.